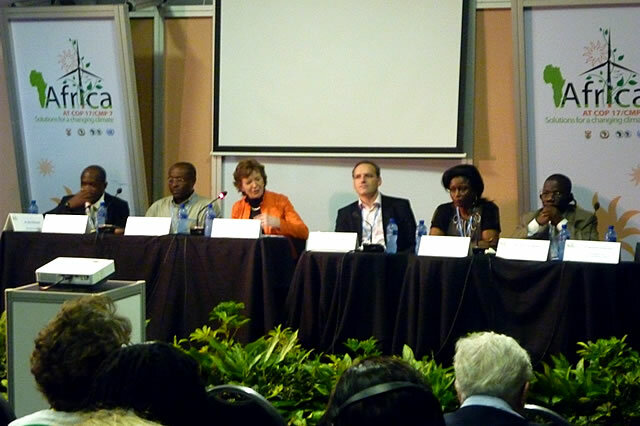 Mary Robinson moderated a roundtable discussion today on REDD+ in the Africa Pavilion at COP17 which looked at the broad experience in Africa of addressing the challenges of REDD+. The discussion drew on the Congo Basin Forest Fund’s work with REDD+ pilot projects in the Democratic Republic of Congo (DRC) as part of government efforts to define a national REDD+ strategy. Also discussed were approaches in forestry and agriculture to introduce and promote sustainable natural resource management in national development agendas. The event also explored how REDD+ can be made a reality in Africa in both rainforest and dry forest countries. In her final words of the discussion, Mary Robinson highlighted the human dimension and said that stakeholder participation in REDD+ is important, especially the participation of women and indigenous people. She said there is a need to make REDD+ deliver for Africa and a development first approach which addresses social, environmental and economic needs is possible. The Foundation’s report Pursuing REDD+ as a viable development option: Lessons from Guyana’s experience [36 pages, 4.32mb], was mentioned during the event as a South-South sharing of experiences on how REDD+ has the potential to deliver economic development while preserving forest reserves.